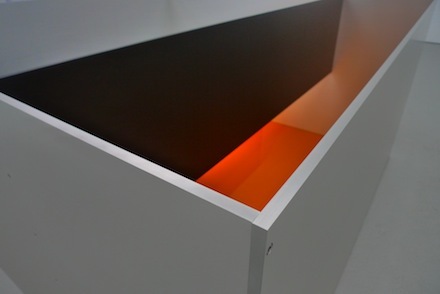 Donald Judd, Untitled (Menziken 89-2) (1989). All images by Nicolas Linnert for Art Observed. David Zwirner gallery, now exclusively representing the Judd Foundation, is currently showing a collection of works by Donald Judd originally part of a seminal 1989 exhibition. Including nine sculptures and three wall-mounted drawings, the grouping showcases pieces brought together from international public and private collections. On the last day of the show, the gallery will be holding free screenings of Marfa Voices (2010), a film by Rainer Judd about her father’s philosophy and work. Also shown will be The Artist’s Studio: Donald Judd (2010), a film by Michael Blackwood comprised of interviews with and footage of the artist. Screenings will be at 1pm, 3pm and 5pm on Saturday, June 25th. 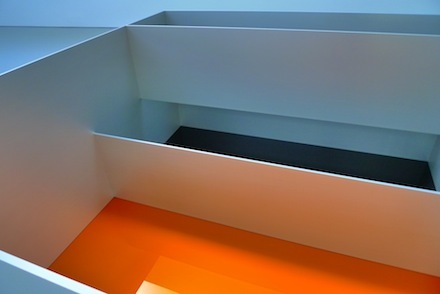 Donald Judd, Untitled (Menziken 89-2) (detail), (1989). 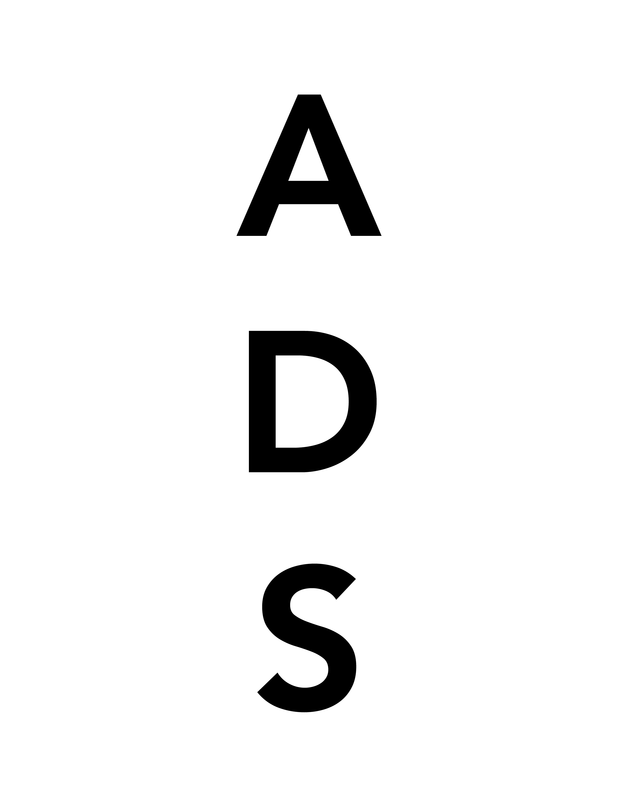 The artist’s catalogue, in spite of Judd’s personal opposition to the label, is regarded as a principal example of what is historicized as Minimalist Art . The works on display exhibit the artist’s philosophy of structural transparency and environmental cohesion. In each sculpture, it is clear how the individual planes are pieced together seamlessly, as well as where the anodized aluminum ends and colored Plexiglas takes over. Considering the sculptures in spatial communication, the gallery arranged the works to form straight lines and radiate a unified compositional experience. Each sculpture operates on a rigorous precision—the corners created are sharp, and what is made of multiple parts becomes ostensibly singular. 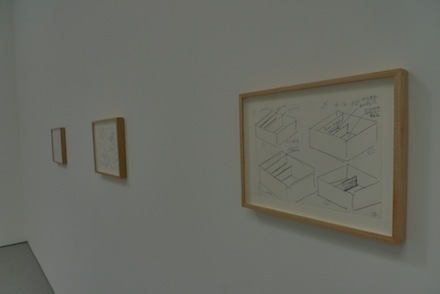 Also included in the exhibition are three drawings that demonstrate Judd’s material planning and spatial framework. Made in 1988-89, the collection of work shown was last exhibited shortly after its completion at the Staatliche Kunstalle Baden-Baden in Germany. The grouping was the artist’s first use of colored aluminum for floor mounting on a scale this large. Drawings by Donald Judd at David Zwirner. 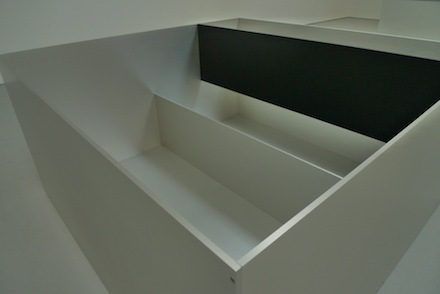 Donald Judd, Untitled (Menziken 89-5), (1989). 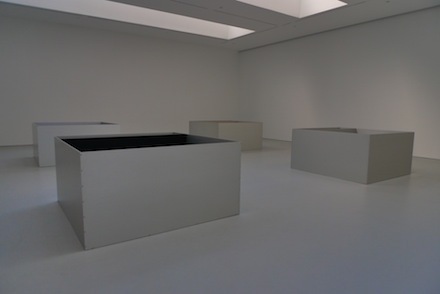 David Zwirner’s representation of the Judd foundation is the latest addition to a growing roster of Minimal and abstract art stemming from the 1960s and includes John McCracken, Fred Sandback, and Dan Flavin. 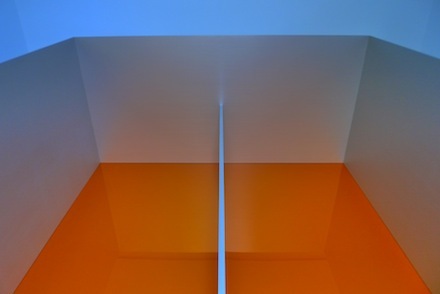 Donald Judd, Untitled (Menziken 89-1), (1989). This entry was posted on Saturday, June 18th, 2011 at 7:14 pm	and is filed under Go See. You can follow any responses to this entry through the RSS 2.0 feed. You can leave a response, or trackback from your own site.